Hey, guys! So, a while back I promised that I'd show off some of the conceptual artwork from the game and talk a bit about how it developed. I always find it fun (and insightful) to see some of the process of other artists and game designers. 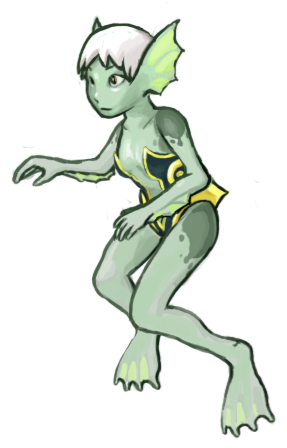 Also, it's a nice way for me to reflect on the time I spent working on Aquaria. Naija's obviously the most important character in the game, so I thought I'd start with her. Hopefully this will be the first of a series of articles about how we created the game. Enjoy! 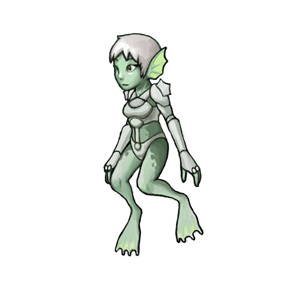 I believe this is the first ever drawing of Naija, done shortly after Alec showed me his Aquaria prototype. Actually, at the time her name was "Rimu" (pronounced "Ree-mu." I came up with that name the way I usually come up with fantasy names (and the way I named my characters in my old game Eternal Daughter) - by putting sounds together that sounded good to me! Naija's a much better name, though. 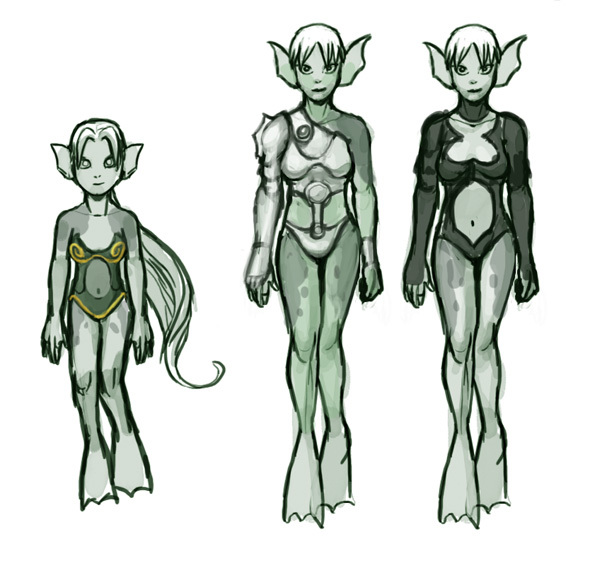 As you can see, the basic design hasn't changed too much, although Naija looked a bit more "fishy" back then, with bigger ears, more pronounced gills, and some fins on her arms. She also had a long ponytail. Mostly, I just wanted her to look different from your typical mermaid. Even though I'd been using Photoshop for a few years already, I still felt pretty uncomfortable with it. 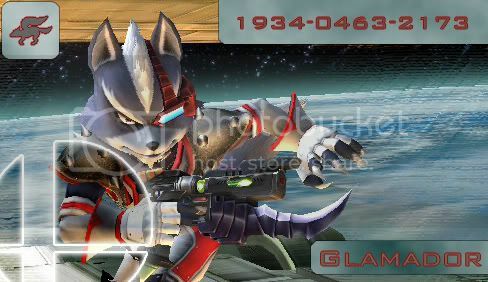 The armor has evolved a little bit - now the very symbolic spiral is there on the suit and I've added the armbands. Her gills are gone, too, although she's still got the long hair and the big ears. 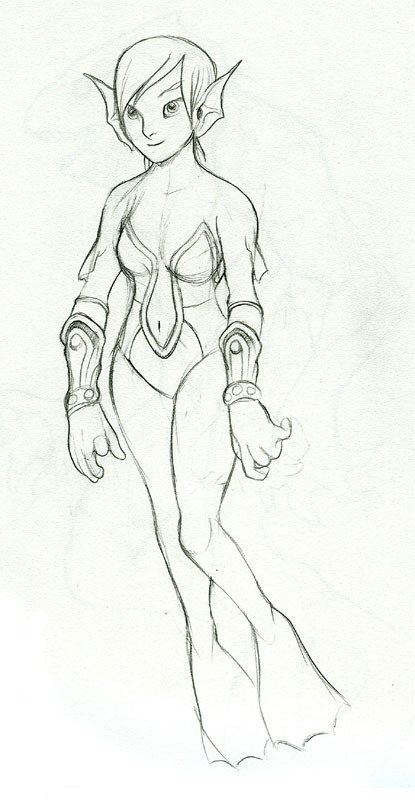 Yeesh, even today I'm not that great at human proportions, but her arms are way too skinny compared to her legs in this sketch. Practice, practice, practice! Naija and friend... I rather like this one. Definitely a much more interesting pose. Younger and more energetic-looking, also. One thing you'll notice is that Naija's face changes a lot in each of these sketches. 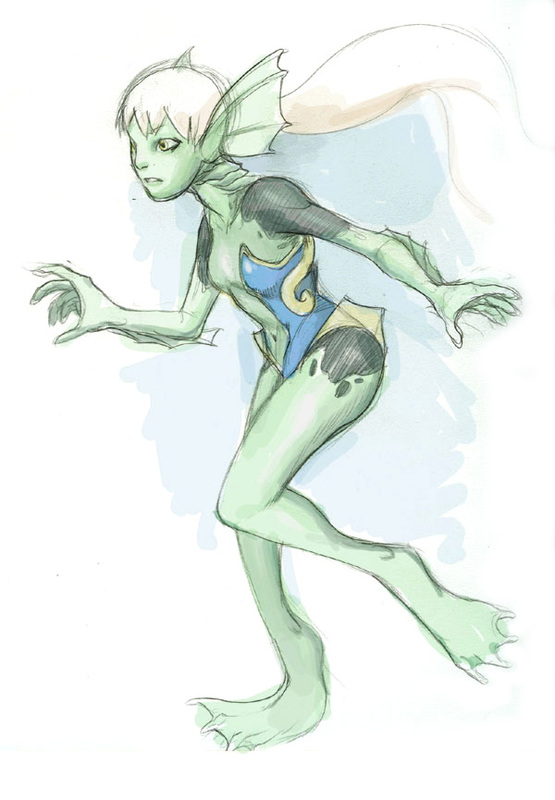 I tend to try out and incorporate a lot of different styles into my drawings, and the same was true for Aquaria. Sometimes I'd try a more realistic rendering of Naija's face, and sometimes I'd go for more of a cartoony or anime look. Okay, this is much better! Both as a drawing and as a character. She's missing a lot of things from previous drawings that ended up returning (like the coloration on her arms/legs, and the flair of the suit), but it's very close. I like the little vestigial flippers on the upper arm in this one! Up until this point, Alec had been improving the game engine and we were discussing all kinds of design issues - everything from story to gameplay. As I recall, I don't think there was too much discussion about Naija's personality - that seemed to be an aspect of her character that we readily understood and agreed upon. I think she embodied a lot of the strong females in all of our lives, both real and fictional. In a certain way, for good characters who you can become personally invested in, I think they're very much already designed, and your task as an artist and designer is to bring them out rather than create them. Anyway, I'd been doing a lot of test sprites in between these conceptual sketches. 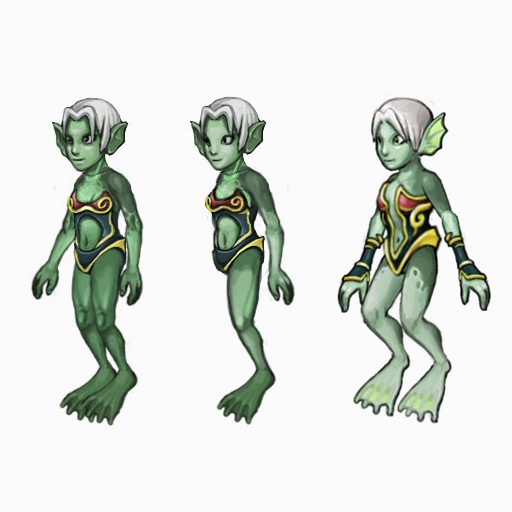 Getting the look of the sprites right was a tough challenge for me, as I was, as I explained above, still relatively uncomfortable with painting in Photoshop. We also weren't really sure what the best approach was. Here are a few of the, er, slightly embarrassing incarnations of the Naija sprite. These were... a bit over-rendered and lost a lot of personality that made the original Naija sprite at least somewhat interesting. Part of the problem was that by this point we had decided to use a "puppet"-style animation system instead of the frame-by-frame method. Because I was working on each body part separately, I had a tendency to over-develop the Naija's musculature, and render everything in a very forced, anatomical way. Eek, the face on that leftmost one is kind of... frightening! Alec's critiques were really helpful here, and together we were able to pinpoint what was working and what wasn't. But man, it was hard to admit just how bad these were, because I was pretty proud of the way I rendered everything, even if the overall look didn't look good. Eventually, I just started from scratch, with the original sprite as a basis. Here's a depiction of Naija as a child, and some where she's wearing armor. The armor had significance in some of the storylines we crafted (and eventually tossed out). You end up going back and forth a lot, looking at the various elements that you've created and choosing which ones fit and which ones need to be discarded. For a game like this, where whether the player identifies with the character is of the utmost importance, it's crucial that the design is true to your image of the character. Looking over these images, I'm reminded at how much difference the little details made. I'm also reminded at how much I grew in terms of my own abilities, and how limited I was by my lack of experience in the beginning. By the end, I think we did a pretty good job of representing Naija as we imagined her (take a look at the right and bottom to see how it ended up). I'd definitely like to think that, wherever she might be, she approves of how we depicted her in our "little" game. Hope you enjoyed! Of course, there's the question of the various forms which Naija can transform into and how those evolved. I'll save that one for another thread. Wow, that's great stuff! Thanks for sharing it with us. While I like some of the early drawings, basesd on the above I think the final Naija is the best. And that says alot about your style. Naija only kept improving as you went along. I'd love to see how some of the philosophical and psychological aspects of the Energy and Beast forms (as mentioned by Naija in-game) played a part in the creation of the designs. These kinds of threads are awesome. This is a good thread. Thank you Derek! Very nice. Thank you, Derek. you spoil us Derek, this is such sweet nutrition to see character dev and concept art is so fun to see, more so if it's something as grand as this. 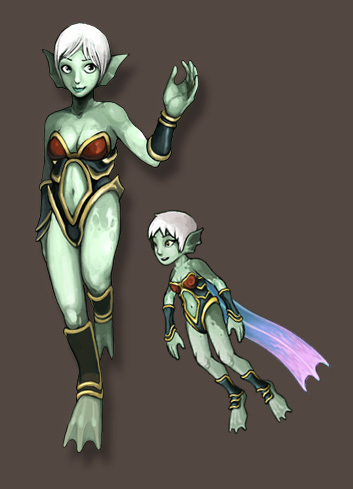 you can really see the amphibious, froggy/newt like traits in her evolution. 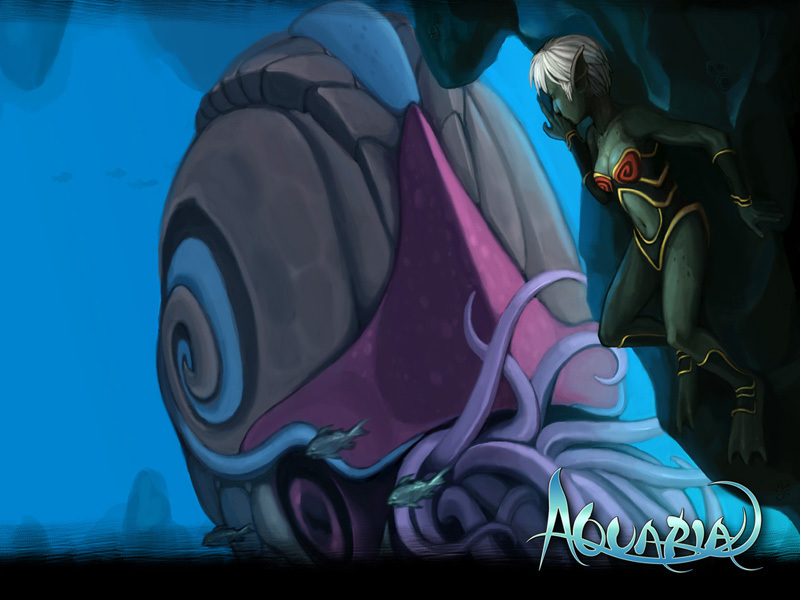 Awesome, seeing this I again hope that there will be a next part of Aquaria. Beautiful work Derek, and very good self critique also it always shows how willing an artist is to grow and learn with their art. Sweet, I 'm really glad you guys liked it! There will definitely be more to come - I'd like to chronicle as much of the experience as possible. Well I say you do Energy form next followed by pets/enemies, then Beast form, then Li. I'm not saying definitely go that way...it's up to you...but that's the order I'd like to see them in. Well I think that's a design choice. Mia probably hasn't aged since she ran away what with her being "perfect" and all. Naija is a different person, looks different from her mother, and probably hasn't aged either. Nice drawings! I wish I could do that! I think Derek shouldn't practice any more, or we might all explode.